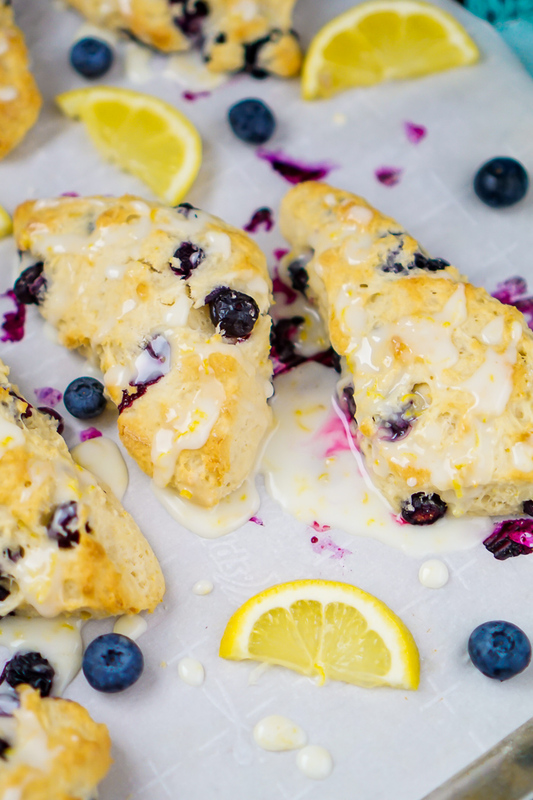 Moist and flavorful Lemon Blueberry Scones with Lemon Glaze are definitely my best scone recipe and one of my most popular posts here on The Love Nerds! Whether enjoyed on a warm spring day or on Christmas morning as a holiday recipe, these scones are always the perfect addition to your table!! Blueberry Lemon Scones are a holiday favorite! Prior to a few years ago, I had only ever enjoyed a scone on a continental breakfast platter which means they were always a little dry and bland. I decided to start tackling homemade scone recipes, starting with my spiced pumpkin scone recipe. They are one of the first fall recipes I make every year and never disappoint as they are soft, moist (sorry if you hate that word!) and full of great flavor! Definitely better than any scone recipe I had ever tried before! Well since then, I’ve enjoyed trying other flavor combinations, like Orange Cranberry Scones and Caramel Apple Scones. 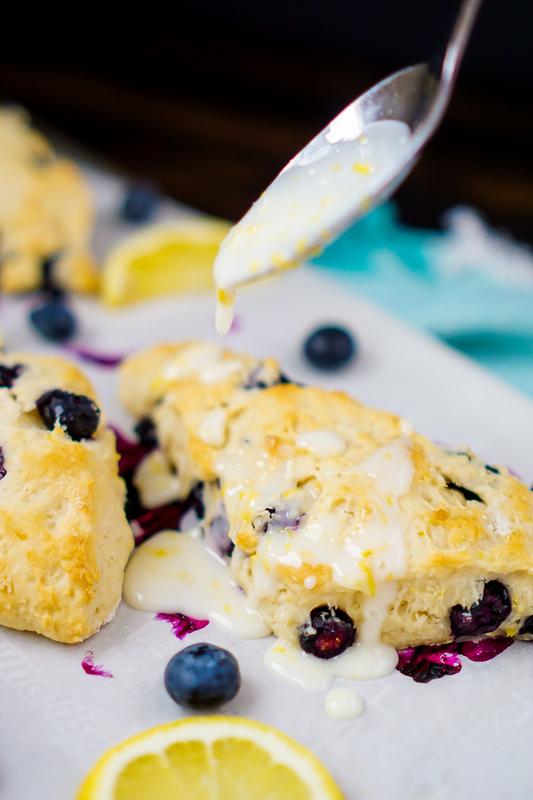 This recipe though for Lemon Blueberry Scones is definitely my favorite! One day, my mom and I were talking about making a lemon cake, and she sent me home with blueberries the same day, so it got me thinking about trying homemade Lemon Blueberry Scones. Lemon and blueberries might be my favorite fruit pairing – sweet and tangy at the same time with a gorgeous burst of color! I just love how blueberries turn purple, almost magenta, after being baked. My husband, who pretty much never eats breakfast, eats breakfast when these are in the house. I once even caught him in the kitchen at 10 o’clock at night trying to eat his second scone of the day for dessert, which is only a problem because then there would be less for me! 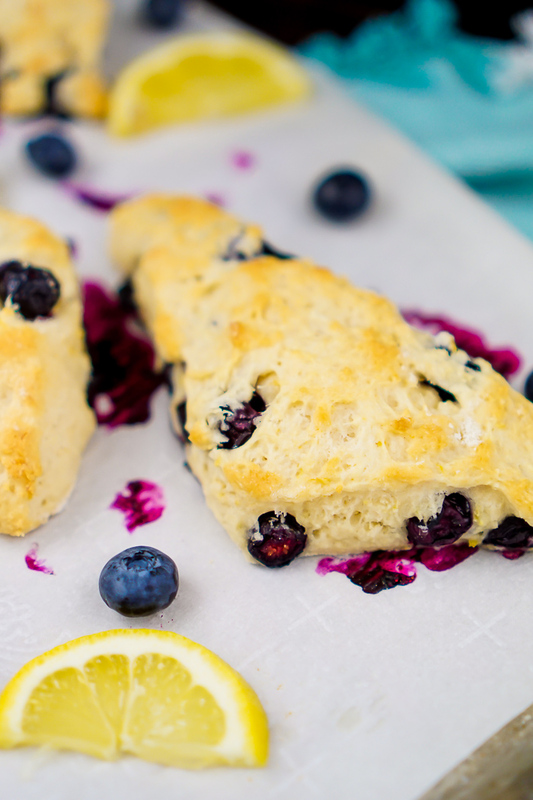 These Blueberry Lemon Scones do make a tasty breakfast, snack and dessert in my world! As happy as I am that he loves these Lemon Blueberry Scone, I want to make sure there are plenty for me to enjoy with some fresh fruit and coffee. Perfection for me! Utter perfection. Breakfast is my favorite meal of the day so having tasty treats in the house like this make life better! They’re better than Cheerios any day. Consider making them any time of year for Easter, Mother’s Day, Christmas or New Year’s Day Brunch! My favorite part of this recipe might be the lemon citrus glaze on top! You could easily use milk instead of the lemon juice if you don’t love the citrus flavors as much as I do, but I personally think it would be a shame. It’s definitely meant to be a Blueberry Lemon Scone with Lemon Glaze. Lemon Blueberry Scones with a Lemon Glaze is an Easy Scone Recipe for Every Season! In your stand mixer bowl, combine flour, sugar, baking powder, and salt. Cut the cold butter into smaller pieces and put on top of the dry ingredients. Using your paddle attachment, mix the butter and dry ingredients together. Work your way to medium speed. You want the butter to break up into small little pieces. BE PATIENT! It might take a little time but the butter will break down into the mix. If needed, you can stop part way through, use a fork to mix things around and break things apart a little more, and mix again using the paddle attachment. Stir in milk, vanilla, lemon juice and lemon zest until moistened. To add in the blueberries, I patted the dough out on a lightly floured counter and folded the blueberries into the dough. Be careful not to squish to avoid the blueberries bleeding too much. Then, by hand, form the dough into a rectangle. You want it to be about an inch thick. Cut down the middle, dividing the dough into two rough squares. Then, cut diagonally for a criss cross with both of those squares. This will give you 8 pieces. Place one-two inches apart onto a cookie sheet. I liked to place them on parchment paper or baking mat. Bake for 15-17 minutes or until golden brown. Cool slightly and drizzle with glaze. Combine all ingredients in a small bowl. Add a little more (or less) lemon juice in order to get the consistency you need. Looking For a Lot More Scone Recipes? Can I make the dough the night before and bake these in the morning? I’d like to bring them to a church breakfast and have them nice and warm. Tasted great and came out perfect at higher altitude (baking in Denver). These are my favorite scones. FYI – I make these by hand – no mixer – I use my pastry cutter to chop up the butter into small pcs. I made these this am. Very hard to resist eating more then one. They’re delicious! The glaze is a nice touch. I want you to know I had to leave the house while these scones cooled because they smelled so tantalizing! I would describe the texture as that of the best baking powder biscuit I’ve ever eaten. And the taste – heavenly! You nailed it with this one and I have a new “signature” recipe for blueberry season. Thank you so very much! I don’t own a stand mixer. How would I proceed without one? You could grate the butter and use a fork and/or your fingers to incorporate it into the dry mix. These were delicious!! I substituted almond milk for the regular milk and ?. Thanks for sharing this fabulous recipe! I popped some fresh blueberries in the freezer the night before and worked them into the dough. They still broke and were fragile, but not too much. Fresh blueberries didn’t make the dough turn purple as canned or frozen berries will. I had never made scones before and these turned out wonderfully. I find that some batches of blueberries will break no matter how careful I am, and then others are perfectly fine. I’m not sure why! I am glad you were happy with the end result though. I’m watching to make a batch soon. I need to brighten up these cold winter mornings! I fell in love eith scones years ago on a trip to England. directly after, I was diagnosed with a milk allergy. I have been looking for a recipe ever since that didn’t call for cream. I can sub almond milk for milk, but when I tried making cream in the microwave from almond milk, it was a disaster. These are wonderful and I can’t thank you enough. I doubled the recipe figuring that the family would be eating them also. By lunch they were all gone, and I was mad at all of them as I only had one. Will hide after this. Again THANKS !!!!!! I am so glad this worked well for you! These scones are probably my favorite. I will say, my other scone recipes use a lot of coffee creamers as the “milk”. While I have not tested it myself and therefore can’t say for sure, an almond milk might work in place of those creamers. Baby wouldn’t sleep this morning so I surprised the hubby with these when he got up to work. Absolutely FABULOUS!!! They’re so delicious! I usually cut sugar in half on most recipes but this one had just the right amount of sweetness and I didn’t make any adjustments. Thanks so much for the great recipe! 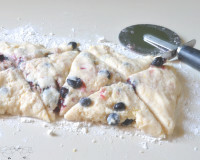 OMG they were to die for, I didnt fold in the blueberries but just dotted them over the dough….. My family loved them and I liked the fact that they didnt require too much sugar. Love your scones. Thank you. Just made a batch of these last night — delicious!! I was just wondering – if I made these as mini scones and cut in to 16 instead of 8, would I need to adjust the baking time? TIA! Question….can you use frozen blueberries that have been thawed? I really want to make scones!! I haven’t done it myself, but I can’t imagine it being a problem. I wouldn’t even thaw them very much, because it’s easier to fold the blueberries into the dough when they are cold and a bit firmer. Thanks! I’m trying this recipe! I need to make this the night before, what is the best way to store them? My first time making scones- these were HEAVEN! I had to stop myself after eating two (ok I started on a third). Thanks so much for the simple and delicious recipe, I will definitely make these again- I love all things lemon! It does make 8 scones. Hallo Maggie, I just tried your glazed lemon blueberry scones, it was so delicious. Thanks for sharing the recipe. :-). Amallia. I am so glad you liked them, Amallia, and for stopping by to tell me!! Hi there. I just made these a few hours ago and had such a hard time when I folded the blueberries into the dough!!! Despite my best efforts to be gentle, the blueberries still burst, making the dough “juicy” and hard to work with on my surface (also despite how much flour I used). Any tips to make that process easier?? Hi! Yummy recipe! I made these on Saturday for Mother’s Day and everyone loved them. One thing I noticed, though, was that because I made them the day before, along with the glaze, by Sunday, their texture was more like a muffin than your traditional drier scone. I will have to make them again the day I eat them and see if there is a difference. Delicious, thank you! Sue, I am so glad that you and your family enjoyed the scones! It is possible they weren’t the typical drier scone because I like mine on the moist side. If you like yours drier, you could try using a little less milk and possibly eliminating the glaze. Your scones look so delicious! I think I may try to make these. I’m not a scone fan, but these do look great. Thanks for sharing. These are beautiful! I need one right now! Those look delish. I enjoy the blueberry lemon combo! Mmmm, we have a bunch of blueberries in the fridge now. We might have to make us some of your tasty looking scones. These look AUH-MAZING. I can’t wait to give these a try, I’ve never had a scone before. 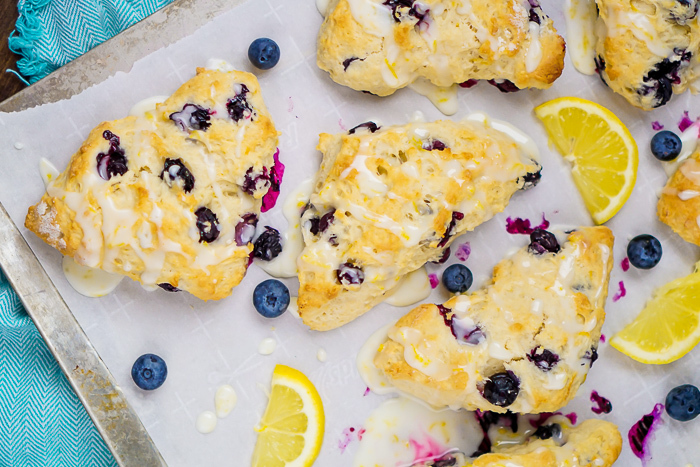 These lemon blueberry scones sound so scrumptious! I’ll pass this recipe on to my hubby (the chef of my family). Thanks for sharing this recipe! I’m taking my first crack at scone baking for my daughters 4th birthday party – it’s a tea party! Oh my gosh. I’m supposed to be sticking to my diet right now… but yuuuuuuuum! Oh I bet these are so good. These just make me think of spring! I’m impressed. I’d definitely try one of these! Those pictures are great. I can almost taste the berries popping when I look at it, yum! I need to make scones because I’ve never even tried. you make it look so simple! Those look amazing!!! I want to make them now! Blueberry and lemon are the perfect combo! These look delicious! Love that they’re easy to make! The best scones I ever had were back in the 80s on a rip to Great Britain. These look just about as good as those did! These look amazing! My youngest would totally love these scones. I’ve never made scones before, but these look delicious! I love the combo of lemon and blueberry together. I just might have to try my hand at making some. These look so amazing! YUM! I wish we had these right now! OMG, wow. These looks soooo yum! Seems like a great treat. Would love to try this! I love the glaze! I’m a sucker for anything lemon so I’d definitely try these. These look so yummy! My two favorites are lemon and blueberry. When you put them together – heaven! YUM! These scones look amazing! These look so fantastic! Glazed scones sound amazing with my tea right now! Oh my! These look so sweet, tart, and delicious! I bet they taste amazing with a good cup of coffee. The combo sounds really wonderful. I absolutely love scones, and I can practically taste how delicious these are! These look amazing! I love breakfast foods, and I’ve never made scones. I do, however, have a ton of blueberries that are dying to be put to use for breakfast soon. Those look delish. I would totally go for the blueberry! Who am I kidding, I’d go for lemon too! I just love scones! I love the lemon blueberry combo. Will have to try out your recipe. Thanks for sharing. Scones are awesome! They are a great bread recipe for just about anyone, and when you have the base recipe you can add so much to it. I’ve never made scones before, but I may have to after looking at this recipe. WOW! Looks so good! I am salivating. These look delish!!!! I love anything with blueberries! I am adding this to the recipe box now! I have never settled on a good scone recipe- gotta try this! Those scones look so inviting I want to reach right out a grab one. I think I’d even like to try the dough! I have never made scones but you can bet I will be giving it a go now. Thanks for this recipe. We love scones at our house and these look fantastic – can’t wait to try! OMG you scones looks so good! I could just eat my screen right now! I’m for sure going to pin this, thanks! These scones look delightful. I love lemon flavored treats. Never been a blueberry fan, but this recipe could possibly change that! These look so yummy! I love scones. I cannot do the blueberry but I will pin for those that can! AND your pics are great! These look so perfect. Maybe a Mother’s day breakfast?! Those sound delicious! I do love me a good scone! G’day! Love blueberries and wish I could try one of these right now!